‘Swarm’ refers to outdoor clumps of Honey Bees on bushes, trees, or structures where they are taken with a vacuum, box, or bucket. 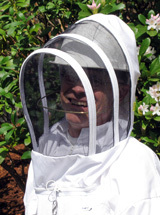 Removal of hornets, wasps, yellowjackets, and bumble bees by any means from houses or other structures and from trees, bushes, and the the ground. Removal of honey bees from tree trunks or buildings is sometimes very difficult and often takes longer than one hour. Inspection, Consultation and Advice with no actual removal of nests or insects. Add to all fees $1 per mile to your your address.